ISCAR 2019 had been officially closed on 17th MARCH 2019 at a closing ceremony with Centre for Foundation Studies (CFS) announced as the final overall winner. The sports carnival was held from 4 March - 17 March 2019 with the tagline ‘United We Play, United We Win’. This year, ISCAR was held with 14 games being competed with 92 medals altogether. Throughout the sports carnival, CFS managed to secure 13 Gold, 8 Silver and 4 Bronze medals. 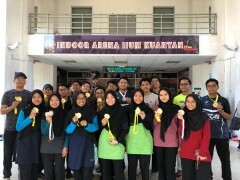 Following CFS at the second and third place is Kulliyyah of Medicine (MEDSS) with 8 gold medals and Kulliyyah of Science (SCIENCESS) with 6 gold medals. Congratulations to all CFS athletes and winners at ISCAR 2019 for doing us all proud with your achievements.